This post is amazing, thanks for all the great tips! Hi Shannon, I’ve some questions about the E spell from Zoe. So the bubble/itself, how is’t textured. Is’t a round circle set up out of different sprites or an actual 3d object? And my second question is how the purple blur effect on the ground is constructed, I think it’s a radial blur with some texture uv scrolling from the middle to the sides. Sorry for making you wait so long Kees. The bubble is a 3D sphere that I key framed XYZ scale so I wouldn’t have to use a skinned mesh with anim data. It also has some glow sprites and sparkles to give it extra motion I used the same mesh for the missile and the bounce. The sleepy puddle is made of a few meshes. I clipped the lifetime of a few things so sorry about the timing haha. I have one mesh like you though, shaped in a cone with it’s edges arcing back upwards that has the lighter purple wave, with a darker purple alpha blend quad under it that scales similarly, and one last darker purple subtractive quad (I could go pretty contrast heavy because of the gameplay importance). Those are the elements that make up that particular portion of the puddle. Shannon i have been wondering, how would you go on about making a beam, cause some of us use 2d textures / billboards, some use cylinders for masking, if you dont mind me asking. Whats the layers between making a good lazer, point of reference. Elementalist Lux Lightning form. Theres so many layers i dont know where to start. One question about the puddle, what kind of textures do you use to create such an cosmic feeling to the inside of the puddle? Heyo Angel! A lot of it depends on the use case, sometimes you don’t need a beam. You can use quads, rays, or meshes. Lux’s storm laser are beams that face the camera with a few different tiled textures that make up the different elements like glow and different speeds of lightning. 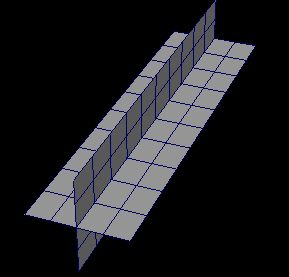 You can specify based on the beam length how many times the texture tiles. Her laser thankfully is straight so she doesn’t need anything fancy. You can create curves for how you want that mesh to bend etc which covers a good range of axis without needing to necessarily use a full cylinder. 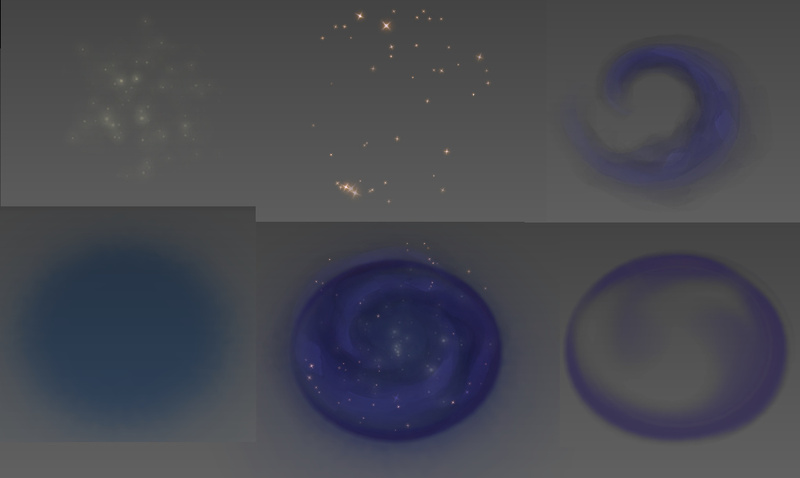 Cloud quads with star mult to give the stars a soft flicker. Tiny star cam facing quads that burst out and slowly spin at different rates. A swirl mesh that rotates as well as has a ligher purple scrolling texture. Subtractive arb quad background. Edge ring arb quad that bursts out from the bubble, starts off light purple then stays dark. I hope that helps :O! The outer ring decal is in a different particle to that it can be team colored. Also I removed the purple butterflies in this screenshot. Those are simply animated planes (one of each wing) with child particle sparkles on them haha. awesome!!! moved it to my reference folder thanks alot Shannon! Quick question! How do people usually keep the beam going where it’s supposed to with meshes? Like from point A to point B. Is this blood one an animation? Like I know how to make some beams in UE4 cascade with source and target modules, but the meshes with movement keep confusing me. Ah you’re such a life saver. Thanks a lot, will deffinitly study this and try to recreate it once im done with a certain shader im working on! Humm, in all of the beams I’ve used you need to specify a start bone and end bone. No matter where those bones are for the length of the particle the beam mesh will connect them and dynamically update their locations. It sounds weirdy that if you move the target or end point during your particle it doesn’t update? At least for a beam anyway. Not sure what tool you’re using though, but that behavior sounds suspicious! @Disturbed A few different ways work but you just have to make sure that the centers of the meshes + mesh UV’s are overlapping. Otherwise when you scroll something through the meshes it won’t be seamless and you can tell it’s two meshes more easily. I wasn’t making beams atm. I have just wondered how these dynamically moving beams are made. What I understand from your reply: It’s usually (almost always) a dynamically updating mesh between start and end point(bone)? I think this clears my question nicely! Thanks. Hello @ShannonBerke thanks for all your knowledge it’s super usefull ! but i have a question about the production, how many time did you take to create 1 FX Skill in League of legends for example the Taric Ultimate ? ( counting concept art ). I always hesitate to answer time questions. There are so many factors from tools to Creative Dev IP changes that I’d hate to mislead or misrepresent. So, take this info with a grain of salt. If memory serves there wasn’t a concept for Taric’s ult. Just the FX took a solid month. At face value that might seem like a long time, but, Taric’s ult is 6 different particles that take up a lot of screen space, can make your whole team invulnerable, comes from a faction that didn’t previously have any shape language to pull from, and needed to be balanced against the thousands of other FX in the game appropriately. Needless to say it came with a lot of challenges, and needed a lot of play testing. We also work using the agile production method, so the design, and other areas were iterating in tandem with myself. There are multiple sources of feedback from discipline, pod, and playtest, that can also warrant changes which is what happened with Taric’s ult sadly late in production. On top of that, especially these days, I’m responsible for much more than just creating VFX, which does take away from FX creation time but means I have the opportunity to have a broader impact, which is really cool. So all in all, time estimates for artists range all over. Thanks a lot for you answer, i know it’s a complicate question and it depend of so many different things, you enlightened me more on this question. Thanks for all you do for the community ! Hey there For difficult kits, how often do you find yourself iterating on them before shipping the final asset? What would you say are the hardest types of CC visuals to sell and why?